Congenital heart disease like hypoplastic left heart syndrome with an intact atrial septum critically obstructed total anomalous pulmonary venous connection (TAPVC), pulmonary atresia, d-transposition of great vessels, etc. may present at birth. Delayed recognition and management may cause mortality. Antenatal diagnosis significantly influences the outcome in these cases. 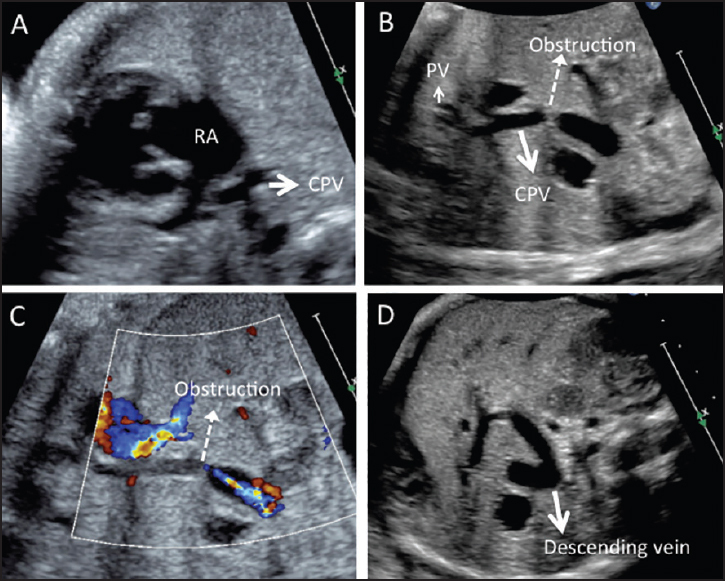 We report our experience of timely managed case of critically obstructed infra-diaphragmatic TAPVC diagnosed prenatally in a 23 years primi. 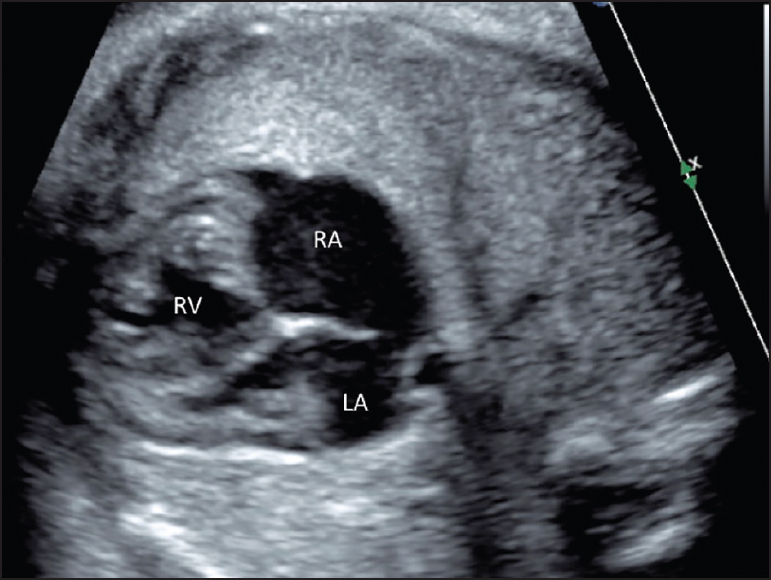 The fetal echocardiography at 26 weeks of gestational age showed abnormal four-chambered view [Figure 1]. Careful interrogation showed critically obstructed infra-diaphragmatic TAPVC to hepatic veins [Figure 2]a-d. Follow-up evaluation showed deterioration in right ventricular function and new onset of tricuspid regurgitation. In utero fetal transfer was done for the delivery to the tertiary level hospital. An elective cesarean section was performed at 40 weeks of gestational age. Autologous umbilical blood about 90 ml was harvested into ethylene diamine tetracetate bag. The birth weight was 2.8 kg and APGAR at birth was 10 in the first minute. The baby was shifted to a triage room for the stabilization. Transthoracic echocardiography (TTE) confirmed the diagnosis of obstructive infra-diaphragmatic TAPVC and moderate tricuspid regurgitation. There was bidirectional shunt across the patent ductus arteriosus (PDA). Both umbilical lines were paced for the blood sampling and hemodynamic monitoring. The patient was intubated and shifted to the operating room immediately within 1 h after obtaining informed consent. The autologous umbilical blood was used as prime in the initial part of cardio-pulmonary bypass (CPB) and subsequently donor blood was added. Deep hypothermia and a circulatory arrest were done for the procedure. PDA was interrupted; the descending vertical vein was anastomosed to left atrium and clipped distally at the level of the diaphragm. The total circulatory and cross-clamp times were 35 and 50 min. The patient came off the CPB with moderate inotropic support. The chest was intentionally opened for 24 h and a prophylactic peritoneal dialysis catheter was placed. There were tachycardia and fall in blood pressure few hours after the surgery due to cardiac tamponade needed re-exploration. The remaining course of the patient was stable and extubated on day 3. The TTE showed small atrial septal communication with a left to right shunt. There was mild tricuspid regurgitation with the right ventricular systolic pressure of 24 mmHg. Oral feeds were started on day 5. Baby was discharged on day 10. Follow-up assessment showed small atrial septal communication with a left to right shunt. There was no evidence of pulmonary arterial hypertension. Although the open cardiac surgery could be performed early in obstructive TAPVC, the right ventricular dysfunction and pulmonary hypertension contribute significantly to the mortality in the immediate postoperative period. A surgical correction soon after birth may be beneficial in selected subset of patients in many ways in protecting the brain, lungs, and other organs. Delayed surgery in the critical congenital heart disease does not seem to be advantageous and rather increase the risk of ventilator dependency, necrotizing enterocolitis, renal failure, and sepsis. Prenatal diagnosis influenced the management of our case. The open cardiac surgery within 1 h after birth is possible if planned properly from the time of diagnosis. Scholz TD, Reinking BE. Congenital heart disease. In: Gleason CA, Devaskar SU, editors. Avery's Diseases of the Newborn. 9 th ed. Philadelphia: Elsevier Saunders; 2012. p. 762-88. Fedevych O, Chasovskyi K, Vorobiova G, Zhovnir V, Makarenko M, Kurkevych A, et al. Open cardiac surgery in the first hours of life using autologous umbilical cord blood. Eur J Cardiothorac Surg 2011;40:985-9.